Stunning, love the POV, colors and composition! Love the colors of water. Beautiful! 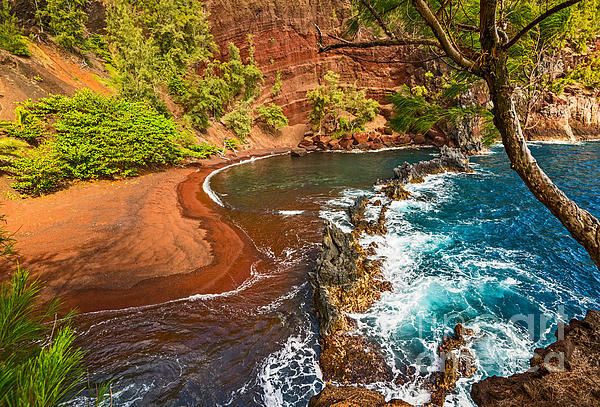 The stunning and beautiful Red Sand Beach (Kaihalulu Beach) in the Hawaiian Island of Maui. 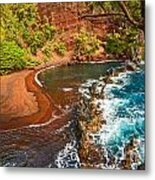 It is a dramatic and beautiful hidden cove unlike any other. 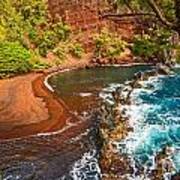 The ocean outside the cove is almost always a deep and turquoise blue crashes relentlessly against the dramatic and rugged coastline. 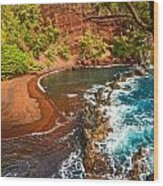 The crescent shaped beach is cut deep into the Ka�uiki Head cinder cone, whose rust-red lava cinder cliffs supply the beach with its red sand. The cove is protected on the ocean side by a wall of jagged black lava rock, further contributing to this exotic and otherworldly scene.